It was a nice day to row on the lake, Montgomery Clift had convinced Shelley Winters, and although she was uneasy about it, she agreed to go. 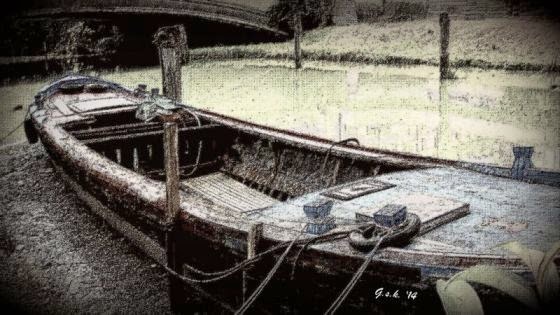 As they took to the small boat and Clift began rowing, Clift had a dark secret. He had met Elizabeth Taylor and nothing would ever be the same. He hated himself for what he planned to do, but he had no choice. Elizabeth was waiting for him. As they reached the center of the lake, Clift brandished the oar overhead. He saw the look of terror in Shelley's eyes. "Shel," said Clift, "I know these are your favorite oars, but Elizabeth Taylor wants to buy them. Sorry, but we'll make a bundle!" No, this isn't exactly the way it plays out in "A Place in the Sun," but it's much nicer I think. And it allows me to pay homage to this great movie as my Friday Fictioneers' response to the picture prompt above. I always thought Montgomery Clift was a fascinating actor. I would have liked to have been just like him except for the dying young part. Then again, it's kind of impossible for me to die young at this stage of the game. I hope those oars fetch the price Clift and Winters are hoping for because from the picture above, the two of them sure as hell could use a better boat! So much nice Perry.. I think I prefer your version.. but I guess I'm a peaceful man. You and me both, Bjorn. However, in the price negotiation over the oars, Clift beat Ms. Taylor to death. So, there is drama after all. Thanks for writing. I enjoyed this one! Great imagination Perry. Thank you very much, Dawn, I ... wait a minute! Dont you enjoy all of them?!! Personally, I was waiting for Shelley to dive into the lake, hold her breath and swim to safety... Ala The Poseidon! I was pulled right into this one, Perry... kind of like Shelley. I didn't know you had a thing for Montgomery Clift. A platonic thing, a platonic thing! Not that there's anything wrong with that. That's a pretty good alternative. Next time Rochelle posts a picture of a boat or of ShelleyWinters, I'm all set. This is quite imaginative, Perry. And you captured it so beautifully, the rowing on the lake...well, just that part! And you put this together so fast. You're such a pro. Well done, Perry, as always! Thanks, Amy. Yes, yes, I did do all those things and so much more too! And I was very happy with your offering too except next time I want to actually see the monster, okay? Ms Taylor demonstrated quite a preference for the things that weren't hers in the first place. :) Nice one. Burn. And you are so right, Sandra. I think that might be a very appropiate comment for a story about a boat, a fisher being one of the things that wasn't hers in the first place. I hope you won't feel bad about this after your diatribe, Jean, but Shelley Winters, lovely women though she is, has been dead for many years. Plus she always spoke well of you. But thanks for your comment and I hope you're doing well. Never did see the original but guess it had more (leading) edge than your pastiche. Ah, the golden days of the silver screen! No, my version is way better! And I came in under budget. Thanks for wriiting, Patrick. You led us on nicely there until the end. It wasn't me that led you on, Sally, it was Montgomery Clift! Thanks for writing. Oh come on, Randy. Don't you remember Perry's post about bromance? Perry, I think it's safe to surmise that you're one of those writers with no oars in the water. I was never crazy about Shelly Winters (despite what you may have heard), but Montgomery Clift did have talent, and Liz Taylor a shopaholic for husbands. You know I understand that when Liz Taylor died, a general invitation was sent to every man in America for fear that one of her husbands might have been left out. I know I was married to her twice and I'm pretty sure you were too. Bjorn told me he only got as far as engagement but had to break it off because she had already married Doug MacIroy. Well, at least I got my 15 minutes of Liz. And believe it or not, Shelley Winters was a babe when she was young though I never married her. Gosh Perry -- You do have a creative mind. Well written. For a moment there I saw the word "sucked" and thought the worst! Thank you for the compliment, Irene. Much better ending. Would the story have changed if they had eBay then? Those oars better go for enough to get Shelley a ticket home. My guess is she'll be handing that fellow his walking papers soon enough after that stunt. Still, I'm happy for a lighter telling of this tale. Fun stuff!